While fans always love to celebrate their favorite franchise, Power Rangers fans now have an officially recognized national day to celebrate it on. Hasbro has established National Power Rangers Day, all geared to help celebrate the 25th Anniversary of the franchise. National Power Rangers Day will take place on August 28th, and you can help celebrate on social media by using the hashtag #NationalPowerRangersDay throughout the day, so make sure to share photos and videos of your Power Rangers-themed festivities. The 28th also holds other significance, as it will be the air date for the anticipated Power Rangers 25th Anniversary episode, which takes place as part of Power Rangers Super Ninja Steel. The episode will kick off in primetime, and though if you can't wait until then you can check out the plot right here. 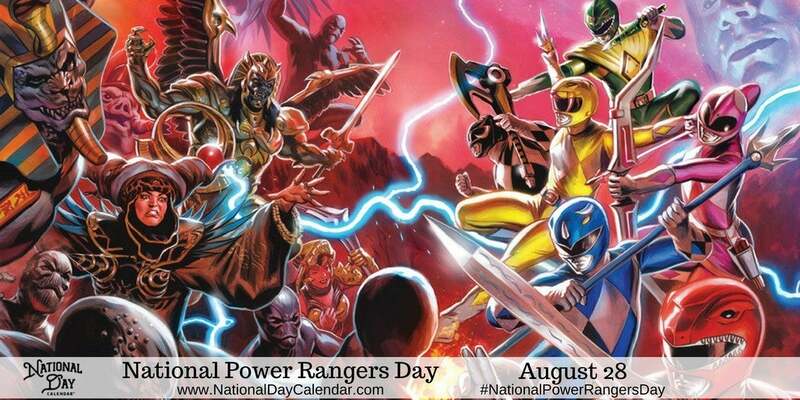 National Day Calendar's official description of National Power Rangers Day is below. "In 1993, five ordinary teenagers exploded on the pop-culture scene with the launch of Mighty Morphin Power Rangers. Together they broke down barriers and defeated evil by demonstrating teamwork, inclusivity, and diversity to people of all ages. Today, this grand tradition continues as new Ranger teams and new generations of fans discover these essential values over and over again. Be sure to use #NationalPowerRangersDay to get in on the fun." The 25th Anniversary special airs in primetime on Nickelodeon August 28th at 8 pm. For more Power Rangers Super Ninja Steel coverage and all things Power Rangers, make sure to follow @MattMuellerCB. So what will you be doing to celebrate the 25tt Anniversary of Power Rangers? Let us know in the comments!